In anaerobic digestion and biomethanization, fermentation process in the absence of oxygen, biodegradable organic matter is decomposed by bacteria producing biogas (methane and carbon dioxide). Sources of organic matter are often dumpsites, purifiers, organic fraction of municipal waste, agro-industrial organic waste, or energy crops. 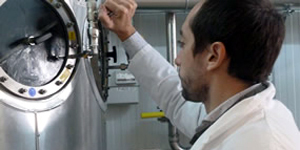 Due to the high energy power biogas has, it becomes an appreciated renewable fuel. Biomethane, biogas subjected to a cleaning and concentration (upgrading) treatment, has similar usage characteristics and possibilities to those from natural gas from fossils. Moreover, the digestate (residual liquid matter) is generated in large volumes and has high humidity besides a considerable concentration of nitrogen and phosphorus. Therefore it is considered as a fertilizer of zero or low cost that can be applied directly or in “fractions”. Energy recovery from microalgae helps reduce CO2 emissions from biomethanization even more, as it is used in the cultivation of microalgae. Energy recovery from byproducts and waste that generally involve cost and environmental problems. Biogas is the most sustainable alternative for agroindustrial organic waste recovery when it has high average of humidity content. Methanization has a positive energy balance, stabilizes the organic matter, mineralizes nitrogen and phosphorus making them more suitable for assimilation by plants, reduces the load of pathogenic microorganisms, and reduces odors, among other advantages. Digestate is transformed into a supplementary or alternative product to fertilizers of zero or very low cost. 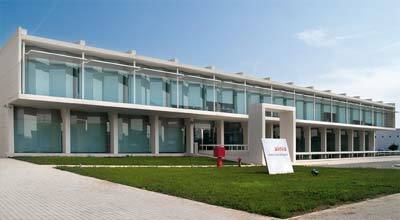 First semi-industrial plant for the generation of biogas and biofertilizers from rice straw. 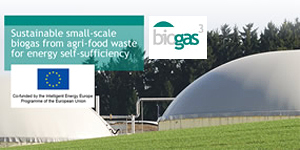 BIOGAS3 promotes the sustainable production of small-scale renewable energy from biogas to achieve self-sufficiency energy. BIOMAN. 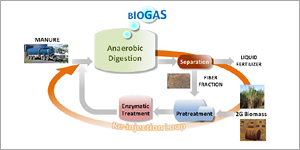 Production of economically efficient biogas from manure and biomass. 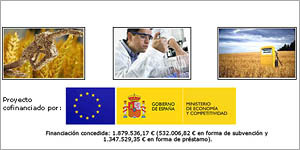 AGROBIOMET. Demonstration of a sustainable system of production and use of biomethane in vehicles from livestock waste and biomass alternatives.